Minister of National Security is leading a parliamentary delegation to the 58th Annual Conference of The Commonwealth Parliamentary Association being held this week in Colombo, Sri Lanka. 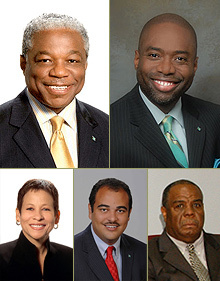 Bernard Nottage (top-left), Minister of National Security, is leading a parliamentary delegation to the 58th Annual Conference of The Commonwealth Parliamentary Association (CPA) being held September 7-15, 2012, in Colombo, Sri Lanka. Kendal Major (top-right), Speaker of the House of Assembly, is attending as a member of the CPA Executive Committee. The other members of the delegation are (below left-right): Glenys Hanna-Martin, Minister of Transport & Aviation; Theo Neilly, Member of Parliament for North Eleuthera; and Maurice Tynes, secretary to the delegation. This event will bring together approximately 800 parliamentarians and parliamentary staff from 175 CPA branches to discuss and share experiences pertaining to the strengthening of parliamentary democracy throughout the Commonwealth. The highlights of the conference will include: the meeting of the general assembly; workshops on important and relevant topics; the executive committee meeting; the meeting of the CPA Working Party; the conference of small branches; the meeting of the Steering Committee of the Commonwealth Women Parliamentarians (CWP); and Society of Clerks-at-the-Table (SOCATT) meetings. The delegation left The Bahamas September 6, 2012. Bahamian tennis great Mark Knowles has announced his retirement from the sport after 20 years of competing at the top level.